I am so excited to be scrapping this weekend! Pat, Maggi and me will spend Friday evening and all day Saturday scrapping with about 20 other women. I'm afraid that scrapbooking has died. Or that it's just not as popular as it used to be. Not as popular at all... but when there's a crop, at LEAST 20 women show up. There's no where to go now! Even my church just announced that there would no longer be a crafting weekend at the church every 3 months. I felt like crying. I would go as often as I could. And Leah and Meredith did such a wonderful job scheduling different crafts to learn, passing out a devotion, organizing the tables, setting up and breaking down. Boo hoo. I wish I could step and up and organize the crop - but I have way more than enough on my plate. Maggi is convinced: there IS going to be a paper-apocalypse. She could be right... the scrapbook industry has sure been hit hard in the past two years. Some examples: Archiver's going bankrupt and closing all its stores; mom and pop's stores have all mostly closed; all the scrapbook magazines went digital - then went out of business. I hear there's a few stores left in North Carolina. But no stores in my area. 1. Offer Up - much more family friendly site than Craigslist; upload pictures of the items you want to sell - you can only use your cell phone; no "personals" with racey text. I bought a beautiful lamp for our family room through this list. 2. Waze - awesome navigation app; Look what this app can do; it will send you an alert when: there are traffic jams; accidents; gas prices; map issue; police ahead; since I drive 33 miles ONE way to work, and I am going the direction that everyone ELSE in the whole world is going, it is very important for me to know if there's an accident holding up traffic, etc. YAY for this app. 3. OverDrive - This is such a cool app; linked to your county library; Download ebooks and - my favorite - audiobooks! I am addicted to audiobooks now. I listen driving to and from work, at lunch, and even before I go to sleep. Eric will listen to the audiobook and within 3-5 minutes, he's snoring. Better than Ambien or any sleep meds! 4. Voxer - leave a voice message for your bff's; no need to text - just leave a voxer! It's fast, fun and nothing is better - you can hear the person's voice, laugh, expressions; sometimes I can't tell if someone is angry or joking in a text - but I can "hear" how they say something on Voxer and know whether a person is mad, sad, or joking. Great app - try it! Over the weekend I created about 10 or so cards. I am always in need of birthday cards so I determined to make some. I chose my least favorite Project Life 3" x 4" cards - as in, I hated the colors! Green, rust, yellow and black-ish colors that I purchased a year or so ago. I knew these cards would never find a place in my scrapbook because I disliked the colors. I HATE to throw anything away that could possibly be used so why not use them on cards? I ended up covering the PL cards with vellum to soften the colors. Then I was really pleased with the result. I added some die cut leaves and flowers on top and used my Stampin' Up stamp and tag punch on top. I have fallen back in love with my Big Shot die cut machine. When I saw the new magnetic platform and hard foam plates - I knew I had to have them. My acrylic plates and platform with all warped and wouldn't cut evenly - even with a metal shim. Using the new foam plates, I have even cut-outs from my dies. That has cut down on my frustration as well as half-cut paper images. I saw this platform and plates at Michael's - and of course I used a 40% off coupon. OH! 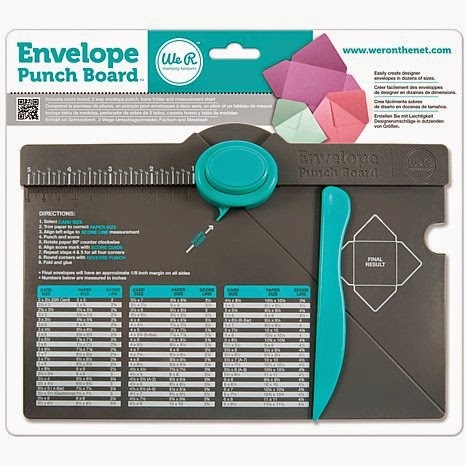 Another great tool I'm freaking about is the WeRMemoryKeepers Envelope Punch Maker. SO cool and easy to use. I can make any size envelope for any size card needed. After finding some old Close to my Heart patterned paper, I made coordinating envelopes for the cards I made. Looks pretty good. I will post a picture or two of my cards and envelopes this evening. I ordered my 2015 calendar pages through Staples - not realizing that the pages did not come with covers. So, after checking out the cost of the covers online - over $30 - I decided that I would make my own! I covered two rectangle-shaped chipboards, using October Afternoon paper. I punched holes in the chipboard and then covered it with glossy mod podge. Then I glued a few things on top. Of course, I used a doily. I LOVE doilies. Added ribbons on the rings and a metal rimmed tag where I wrote 2015. Easy peasy. But I love it. After sleeping in, Eric and me decided to go to lunch. La Farm was our choice - real French cafe! 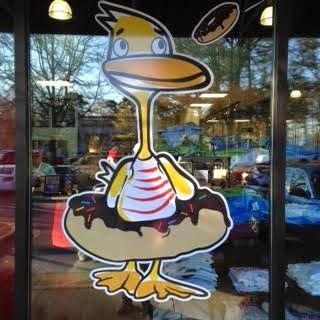 Then on to Duck Donuts (as in Duck, NC) where I had never been. I am forever ruined. I can never eat another donut from Dunkin donuts or Krispy Kreme again. Duck Donuts has the most delicious donuts I have ever eaten. Ever. It was amazing. Their duck icon was so precious - I had to get a picture of him! Inside the shop, there were wooden duck key chains, t-shirts, sweat shirts, and coffee mugs. The line was out the door also. Well, I guess so. These donuts are worth EVERY calorie. Who'd have thunk it? At work there is news on the TV the entire 8+ hours I am working. I know way more about the world news than I EVER would WANT to know about. It's terrifying watching the Islamic terrorists in France shoot a helpless, unarmed policeman yesterday. I couldn't watch it - it was so awful! I'm praying for the French people. It's heart breaking. I have been creating some cards and gift boxes with tags lately. I am going simple. Or should I say "simpler"? Anyway, here's some things I've created. I just realized that I am loving bows lately. I used the Maggie Holmes metal dies and my Big Shot with felt. I never can have enough Thank you cards OR Birthday cards. I'm going to be creative this evening. It's so therapeutic for me. I just love the creative process. Thankful that God is in control today. 1. I will blog weekly. 2. I will NOT be guilt-filled if don't blog weekly. 3. I WILL be proud of myself - IF I do blog weekly. 4. I will be thankful. For everything and IN every circumstance. 5. I will remind myself daily that time is God's trainer. Waiting. Waiting. Waiting. My cross to bear. 7. I will forgive myself if I have regrets. I will not be so hard on myself! I'm my worst critic. 8. Journal, journal, journal on my pages. I would rather "create" new layouts - the artsy-fartsy stuff rather than take the time to journal. That's one of my regrets on earlier layouts. I will journal before I move on to another layout. There. 9. I will call these goals "Guidelines". Goals sounds too legalistic. It's just me. I hate rules for rules' sake. But I can "DO" guidelines and not feel pressure. 10. ENJOY the process. Enjoy my life, my husband, my kids. Enjoy life as it comes. Let go of the so-called "control" I think I have over my life. Haaaa haaaa. Control - such an illusion!